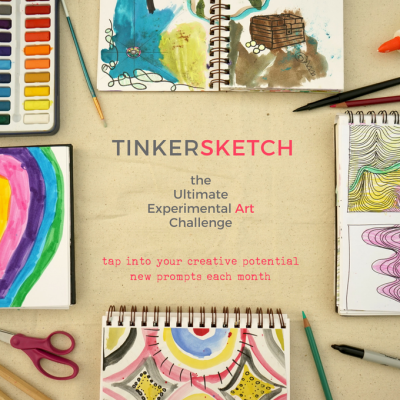 Today’s post is brought to you by Tinkerlab sponsor, Imagine Childhood. I first met Sarah Olmsted, founder of Imagine Childhood, when we I interviewed her about her book by the same name. 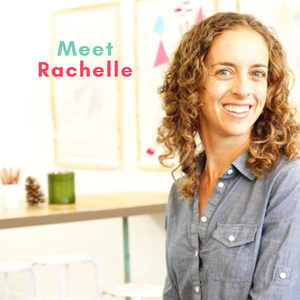 Sarah also has an inspiring shop that outfits children and families for creative adventures. I’m a huge fan of the child-and-earth-friendly supplies that she carries in her shop, and excited to bring you a little piece of Imagine Childhood magic today. Read on for more details about a generous discount and a fantastic giveaway opportunity! It can be a challenge sometimes to find a last minute activity for those days when the weather just isn’t cooperating. From snow and ice to wind and rain, some days, no matter how much of a diehard nature enthusiast you are your only option is indoors. 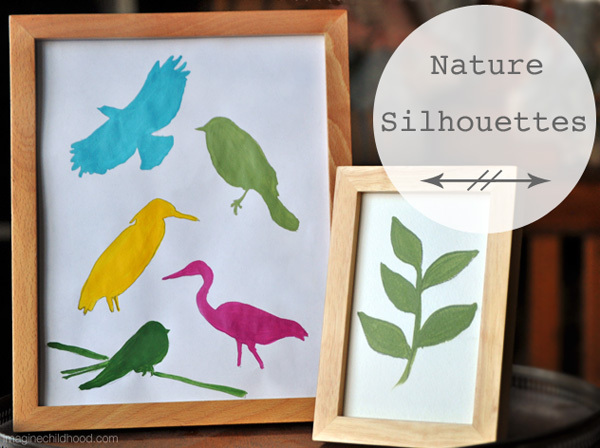 This simple and fun nature silhouette activity is the perfect fit for just those moments and a great holiday gift idea to boot! Trace: Grab your preferred nature study materials and let the kids pick out their favorite plants and animals. Trace the outlines lightly with a pencil. If you are doing this from a book, thin paper and dark images with a lot of contrast work best. If you’re using photographs or images printed from the internet, tape them a window with your paper on top and use the sun to illuminate the images for easy tracing. House plant option: If you have plants in your house, try placing them in front of a light source and tracing their shadows. Paint: Once you have your outlines or silhouettes, have fun painting them in. You could put one silhouette per page, or you could make a composition from a few of them. Discuss: While the kids are painting, share interesting facts about their plant or animal with them, or maybe even join in on the creative fun! Simple and lovely, these silhouettes look great in a frame or on a postcard blank like this. If you want to make a particularly special gift I would even opt for a colorful mat inside the frame in a cameo shape to really set off the artwork. A Gift For You Too! Now that you have gifts for your friends and family, we’d like to give a gift to you from Imagine Childhood (total value is $150)! To enter this generous giveaway, please leave a comment in this post by Wednesday, December 11. The giveaway is open to all readers world-wide. Winner will be chosen by random number generator, and notified shortly after the close of this contest. 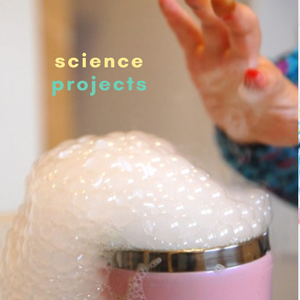 Sarah is also offering Tinkerlab readers 10% off all purchases in the Imagine Childhood Shop, with the discount code Tinkerlab, valid through 12/11/13. Sarah Olmsted. 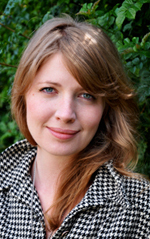 A former exhibition designer for the Field Museum of Natural History, Sarah is the co-founder of imaginechildhood.comand author of IMAGINE CHILDHOOD: Exploring the World Through Nature, Imagination, and Play. Keep up with Sarah on her blog, or via Facebook, Pinterest, and Twitter. What a cool pack. I think my twin boys would go nuts over the scope. Thanks for introducing this stuff. Ooh what fun! Compass? Great isea! What an amazing gift set this would make for an aspiring natural artist. My nieces would adore this set. Such a sweet, amazing gift! We’d love the chance to win. Nature and art! If there was a bag of chocolate chip cookies included it would be the best backpack ever!! Would love to be able to adventure with these supplies in hand! What a fun lovely giveaway by boys would love. Good luck all. I would love to have these items when we go camping next. This would be perfect for my nature and art loving girl! This is an amazing idea especially for long winter areas. Art and Nature together in one gift. A dream come true! My daughter loves leaf art! My boys and I would love this! We are currently living in NZ on a scholarship. We don’t always have the money to buy crafts, but we do explore quite a bit. New Zealand is a great place to learn about nature. There are so many different plants and animals that you can’t see anywhere else. I love the nature cards–we have a few of the big posters, but this size is perfect. How Fun and open ended the set would be! Love “Imagine Childhood”—(and Tinker Lab:) for toys and ideas that promote nature play, science, and art. I would love to win this for my children! Thanks! Looks like a fun way to craft! Wow! This is awesome and I love the nature silhouettes! Thanks for the discount too. Love this store, great giveaway! This would tie in well with our living things theme. Here’s hoping. What a wonderful idea! Can’t wait to try this with my son. I love the bright colors you chose for yours. I love activities that have us admiring nature! I love the simplicity of the project. What a terrific craft! Especially ideal for the snowy & chilly days in Toronto! Thanks for making this a world wide competition. Love the look of Imagine Childhood. What a great idea. My daughter is really interested in a compass and a nature walk would be a great way for her to use it! Thank you! Lovely idea for a nature activity. Thank you. Such treasures! And thanks for the discount code! Wow! My little adventurers would love this! Fun and just in time for winter break! My 3 and 6 year olds are always excited when we do a craft project together. Thanks for the ideas & inspiration! LOVE this! Getting back to nature in all it’s glory and getting creative too, what more could you want?! Wow, my sons (3 and 6 year old) love exploring nature. They would love to be inspired by these activities! Fun way to add more beauty to the natural world! Lovely idea & the book looks perfect for our long summer holiday break here in Australia! Loving this post and the giveaway. Wow! This is a fantastic package! I am not sure if I’ll share it with the kids; or if they wont share with ME…!?!?! THANK YOU! What a beautifully simple idea! What a great pack to go exploring! Love the drawings/paintings too. Another gorgeous giveaway arranged by Tinkerlab … and what great items to fill a backpack with. Crossing fingers that we can take it on our next family adventure! Love this pack! I hope I’ll win it for my kids! What a wonderful idea. So creative yet simple. Not only fun, but important. What a great giveaway. My daughter would love this! My Daughter would love this! She loves to draw and she loves nature! Very interesting. What a great way to get us out and exploring our new home environment here in Phoenix, AZ. It’s very different from what I grew up with in the Pacific Northwest. . Cool giveaway! Thanks. Imagine Childhood is on my “To Read” list for 2014! I have an in-home daycare business and am working on becoming Nature Explore Certified. This would be an awesome addition to our outdoor classroom! looks like so much fun..love the outdoors!! 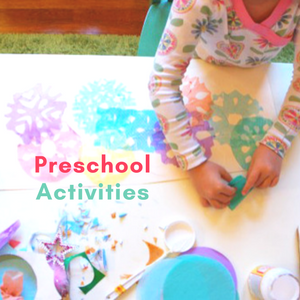 I’ve loved Imagine Childhood for awhile now–and love this activity idea! What a great pack……could do some great things with it! Oh the places we could go and the imaginations we would spark with this great pack! Thankyou. In The business of life I think we all need inspiration to get back to nature and play!!! Ohhhh!! The Nature Cards are just besutiful! Ooh, we would LOVE these! Thanks for the chance! Great package for exploring and creating! Looks like a fabulous creative toy! Yet another great giveaway!! Hopefully I can share this with my after-school program. This looks like a great activity for this run of cold, rainy days we’ve been having! Wow, love the creative ideas! Thanks for the opportunity!! My little explorer would love this.